A glaring omission from almost all biotech discussions of genetically engineered crops is the fact that not one, but a host of chemicals is required to grow them. Perhaps the word ‘required’ is overwrought with cynicism, but “over 75 percent of GMO crops are engineered to tolerate being sprayed with herbicide.” This means that if one were to honestly and accurately portray the safety of GM crops, they would also have to prove that the herbicides and pesticides used to grow them were also safe – at least generally speaking, with the GMOs we have today. They are manufactured, and marketed to be used in synergy. When the biotech industry discusses new gene altering-techniques, not to be confused with traditional plant breeding, they rarely mention that DNA cloning, transgenic alteration, and even gene editing still don’t negate the industry reliance on dicamba, glyphosate, 2,4-D, Agent Orange, Paraquat, Atrazine, and tons more herbicides marketed under different names. 2, 4-D, with a worldwide market of $300 million, causes kidney and liver damage as well as chronic toxicity in the body, among other health issues. They fail to say a word about the fact that chemicals like Atrazine demasculinizes vertebrates, and causes ovaries to shrink. There is no conversation worth having about GMOs that doesn’t also include a discussion of the WHO’s IARC declaration that glyphosate is likely carcinogenic, and so are numerous of the other herbicides used to grow genetically modified crops. Though the USDA can continue to downplay its own scientific inquiry into Monsanto’s herbicide, 200 million pounds of Roundup was dumped in one year recently – and yet we look away when cancer rates, autism rates, gastrointestinal disease, neurological, immunological, and endocrine diseases are rising. Roundup was considered by some to be the ‘safest’ of Big Ag chemicals. Germany, France, and other EU countries have banned the sale of glyphosate, just one of the many Big Ag chemicals being poured all over our food – GM particularly. But the global glyphosate market is expected to reach $8.79 billion by 2019. The USDA continues to ignore farmer concerns, and has now given a green light to Dicamba-resistant seed. Use of this herbicide is expected to rise up to 500 times the current levels. “In the United States, pesticide sales were approximately $12.5 billion at the user-level, which accounted for 32% of the nearly $40 billion world market in 2007. Pesticide use in the United States was 1.1 billion pounds in 2007, or 22% of the world estimate of 5.2 billion pounds of pesticide use. Approximately 857 million pounds of conventional pesticide active ingredient were applied in 2007. Organophosphate insecticide use decreased about 44% from 2002 to 2007, 63% from 2000 to 2007, and 55% from 1997 to 2007. About 33 million pounds of organophosphate insecticides were applied in 2007. Eighty percent of all U.S. pesticide use was in agriculture. 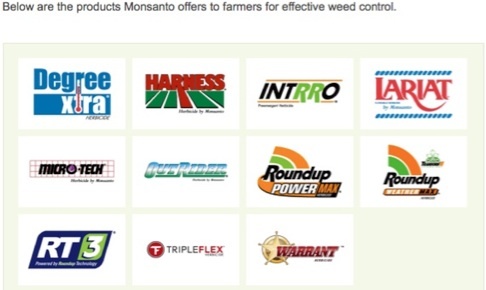 Herbicides remained the most widely used type of pesticide in the agricultural market sector. Among the top 10 pesticides used in terms of pounds applied in the agricultural market were the herbicides glyphosate, atrazine, metolachlor-s, acetochlor, 2,4-D, and pendimethalin, and the fumigants metam sodium, dichloropropene, methyl bromide, and chloropicrin. Why do we argue about GM seed when the stuff used to grow them is so insidious? This is the elephant in the room, but Monsanto, Bayer, Dow, and Syngenta would like you to ignore it altogether.